The French-themed dining treehouse at the Laurel Tree Restaurant in Utopia, Texas is the perfect place for a romantic meal. Pete and his crew met chef and owner Laurel Waters in 2015 when they dined at her guest table during a treehouse build in neighboring Leakey, Texas. They immediately connected over Gerard, the 450-year-old oak tree in the restaurant courtyard. Laurel was looking to create a magical and intimate dining space where guests could celebrate life's most special moments. She also wanted the dining room design to embrace a French aesthetic, as she had earned her culinary degree at Le Cordon Bleu in Paris. A French-themed treehouse dining room perfectly fit Laurel's vision, and Pete could not wait to start building the structure in Gerard's sturdy branches. Less than a year after meeting Laurel, Pete was back in Utopia, building the treehouse dining room. The wooden shiplap siding is reclaimed from Laurel's family property. Pete's concept sketch for the dining treehouse. Pete loved building in Gerard, the 450 year-old oak tree. Gerard's girth is impressive; the tree is nearly six feet in diameter! One design challenge was to create a way for restaurant staff to easily walk from the kitchen to the dining treehouse. Pete designed a ramp with a gentle slope and minimal stairs to make the trek less perilous for waiters. The dining treehouse can host up to six people, making it the perfect space for intimate celebrations like anniversaries, engagements, and birthdays. Read interior designer Tory Jone's Behind the Design article for a closer look at the French-themed furnishings. The stained glass masterpiece above the dining table, made by Stained Glass Crafters Workbench in San Antonio, features a scene from the nearby Sabinal River. Bringing stained glass into your home is a easy way to diffuse natural light and add a beautiful pop of color. Pete tried his hand at creating a small section of this stained glass piece; as fun as the experience was, Pete was reminded that his true talents lie in the trees, not in stained glass. Guests can soak in the views of surrounding poppy fields while enjoying a glass of wine on the Juliet deck. Building this dining treehouse for Laurel was one of the highlights of our year; Utopia, Texas truly lives up to its name! We know that guests will love celebrating inside this magical dining treehouse for years to come. Check out The Laurel Tree restaurant for more information and reservations. 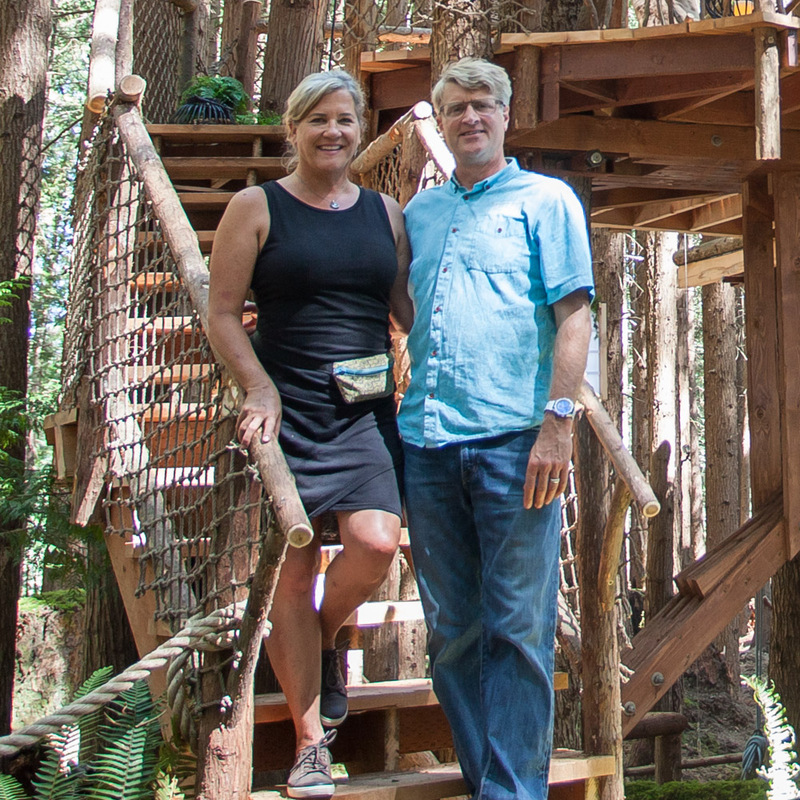 And watch Animal Planet's Treehouse Masters Behind the Build video for a tour of the dining treehouse. Thanks for a magical build, Laurel!